2015 KTM 1290 Super Adventure. Picture credits - KTM. Submit more pictures. 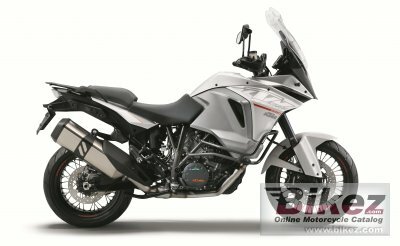 The 1290 KTM Super Adventure sets a new benchmark in the travel enduro segment with a class-leading equipment specification that leaves other travel enduros playing catch-up. The Super Adventure�s uncompromisingly powerful KTM engine is matched by safety and electronics packages that are streets ahead of the competition, which means that sports riding meshes seamlessly with a versatile travel enduro style, making the Super Adventure the perfect ride for any journey. Price as new (MSRP): US$ 15999. Prices depend on country, taxes, accessories, etc. Ask questions Join the 15 KTM 1290 Super Adventure discussion group or the general KTM discussion group. Bikez.com has a discussion group for every motorcycle. Here you may find answers to common questions about the model. If you do not find what you are looking for, you can ask questions. Try out the 2015 KTM 1290 Super Adventure discussion forum. You can sign up for e-mail notifications when other users answer you. If you have information about any technical issue related to this motorcycle, please leave a comment for other riders.